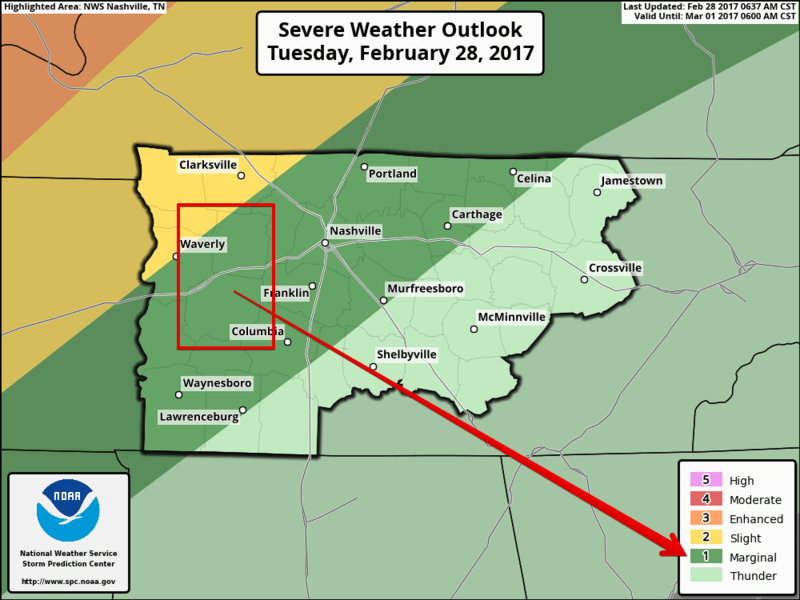 Summary: Possible severe storms today, even better chance for severe storms tomorrow. Once the severe weather is over, we are treated to a nice weekend. We are seeing some rain and thunderstorms move through the area this morning, but our eyes currently are on the severe weather threat for Wednesday. Overnight, the temperature actually got warmer and will continue to rise to about 71 degrees today. We have a 100% chance of rain and storms, tapering to 40% in the afternoon. Rain then increases again after midnight to around 50%, then to 100%. We are expected around a tenth to a quarter of an inch of rain, although some spots may receive more. Today will be gusty as well with winds out of the south at 15mph, with some gusts as high as 25mph. Wind will continue to be gusty in the overnight hours. We are expecting a few strong to severe storms to roll through today around the mid morning through mid afternoon time frame. 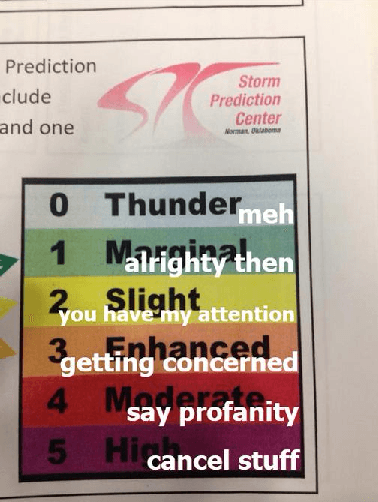 We are currently in the MARGINAL category for severe weather (a 1 on a scale of 0 to 5). While today’s weather won’t be as eventful as tomorrow’s, it’s still important to monitor the weather as our risk for severe weather is not zero. Here’s the HRRR model simulated radar for the rest of the day through midnight tonight. Expect the same high temperature today as we did yesterday as we await the arrival of a cold front. Before the cold front arrives, we have a chance for severe weather both ahead of and with a squall line that will move ahead of the cold front. Wednesday will also be windy, with winds out the south southwest at 15 to 20mph, with gusts as high as 30mph. March… in like a lion…. We are under an ENHANCED category for severe weather today. Note: Dickson County is split between both the SLIGHT (yellow) and ENHANCED (orange) categories for severe weather. 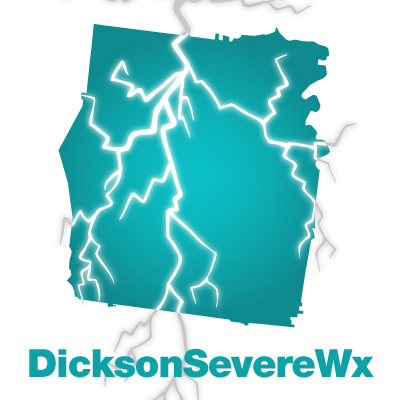 While it could be said that NW Dickson county may see *slightly less* severe weather than SE Dickson county, storms don’t stay neatly in these colored areas. For brevity, I’m treating all of Dickson County as being in the ENHANCED category. Strong to severe thunderstorms will be possible from the lower Mississippi Valley northeastward across the Tennessee Valley and southern Appalachians, and northward into parts of the Mid-Atlantic states and into portions of the Northeast. Damaging winds are forecast to be the predominant severe hazard. Currently, we expect a squall line to form to our west ahead of a cold front and sweep through during the early morning to lunch time hours. The biggest concern appears to be straight line damaging winds, especially if we get a bowing structure in the squall line (indicating more intense wind pushing the line). Some large hail is possible too, and we can’t rule out a possible tornado or two. Here’s the look at the simulated radar from NAM4, trimmed to go from midnight Wednesday to midnight Thursday. According to the NAM4 model, the main time period for us is 9am through 3pm for the most significant part of the squall line, although the models still don’t agree entirely on the specifics. Another model, the NAM3, shows less activity ahead of the main line (the pre-squall line activity appears to die down before it arrives to us) and more defined main line. Here’s the simulated radar for NAM3, trimmed down to Wednesday midnight through Thursday midnight. It does appear that we could have some storms develop ahead of the squall line. If they do, they pose a different threat than the main line. 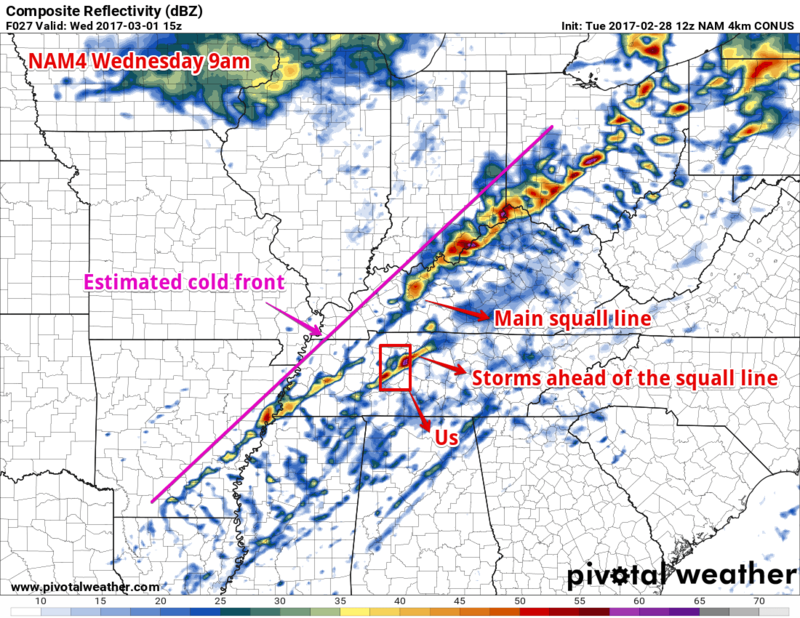 If any cells develop ahead of the squall line, they have the potential to become supercells and produce a tornado or two. Note: Yes, it appears that there is a major storm stretched over both Hickman and Dickson counties, but it’s important to note that the models can’t pinpoint where a storm will be at any particular time, just simply guess at where it *could* be, so don’t get caught up in the placement of one single storm in the models, but the general pattern. This scenario is one we will have to watch carefully. 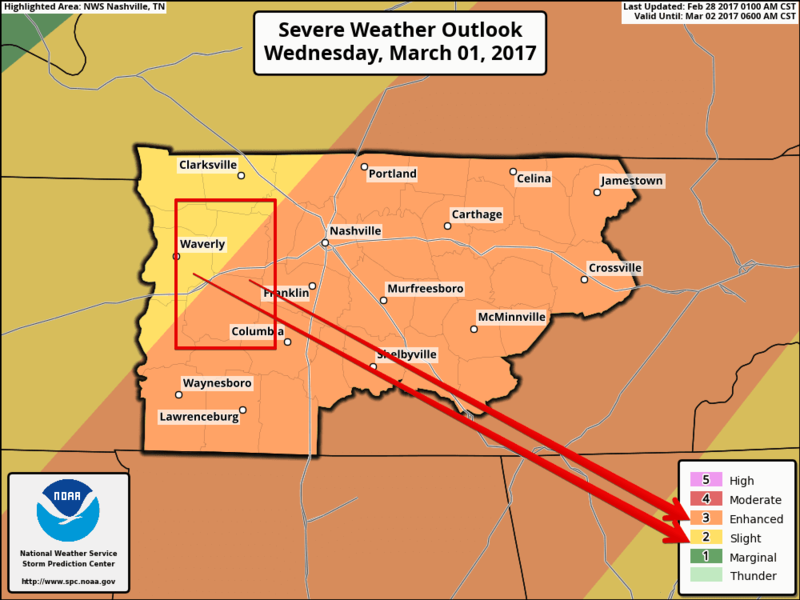 The tornado threat is greater with any cells/supercells that form ahead of the main line, but the threat is not zero for the main line. While I just presented quite a bit that would make some freak out, it isn’t time to be freaked out. We are still 24 hours away and the models still haven’t come into complete agreement, although they are closer in agreement today than they were yesterday. It’s important to stay weather aware and make sure you know what to do in the event of severe weather. After the storms move out, temperatures will drop drastically to 36*. It’s possible it could drop even more than that and then we may have some frost/freezing temps issues with sensitive plants. Thursday will be dry and sunny with a high only to 56*. Winds will be out of the northwest at 5 to 10mph. Thursday night is of concern with freezing temps and maybe frost. Temps will drop to 32*. Protect sensitive plants from temps and possible frost. Friday is looking to be much like Thursday, just slightly cooler high temps. Also protect your sensitive plants outdoors Friday night as well. Temps rebound for Saturday and Sunday with highs in the low to mid 60’s and overnight lows in the 40’s. Our next rain chance is introduced Sunday night with a 30% chance of rain.